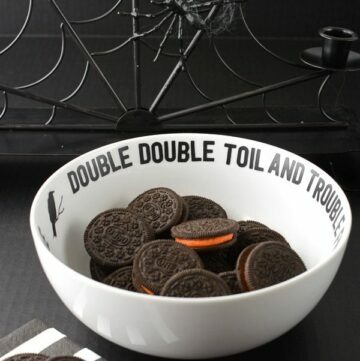 Welcome to the “13 Days of Halloween Treats” Blog Hop! 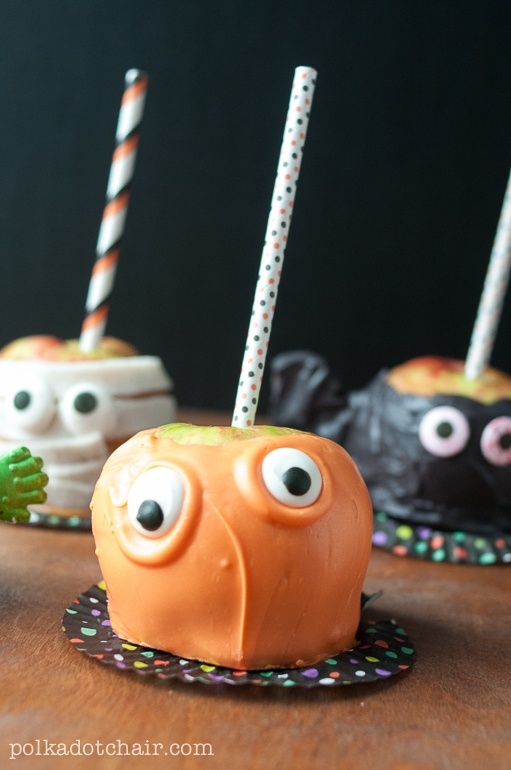 Today it’s my turn on the hop and I’ve decided to give you some Caramel Apple Decorating ideas by making these Halloween Monster Caramel Apples! 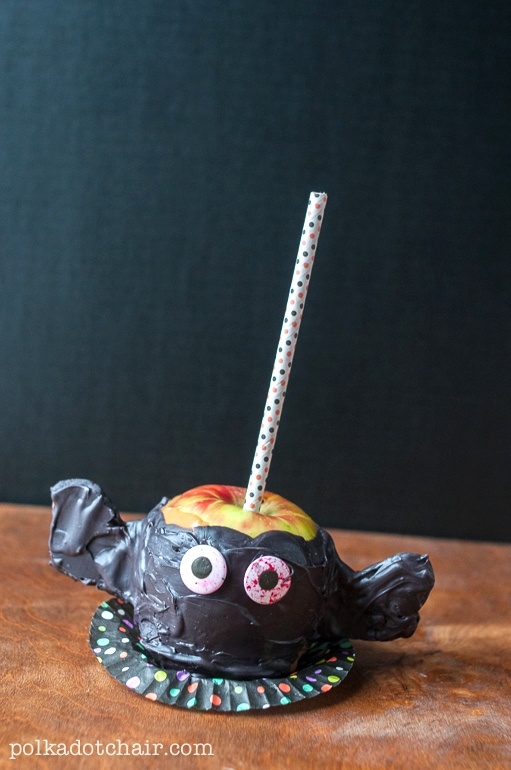 Armed with a box full of spooky sweet Halloween inspiration courtesy of Wilton and Joann’s, my kids and I went to work designing some spooky apples that would be the perfect Halloween Treat! 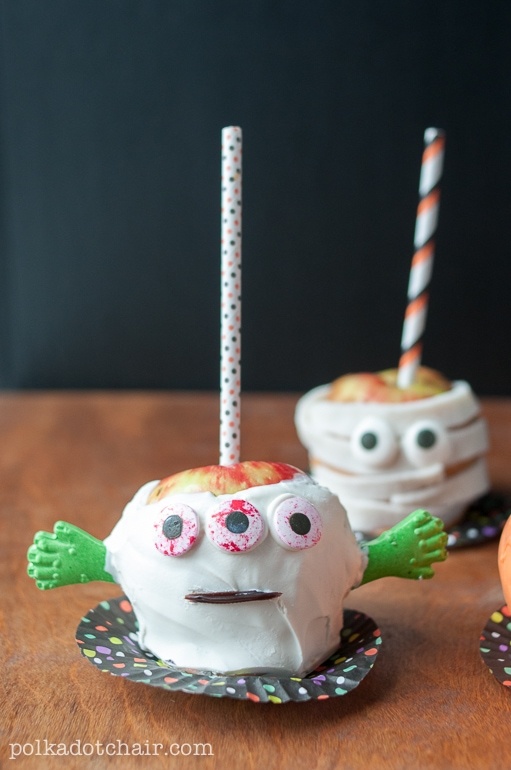 I decided to work with the candy eyeballs, the lollipop sticks, and the monster hands to create my treat for the hop. 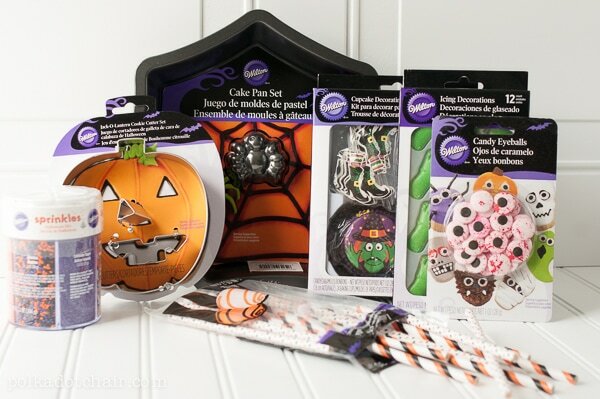 I also headed to Joann’s to pick up some Wilton candy melts and a mummy candy kit also from Wilton. 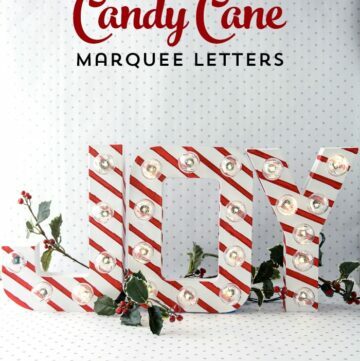 Unwrap the caramels and place in a glass or metal bowl. 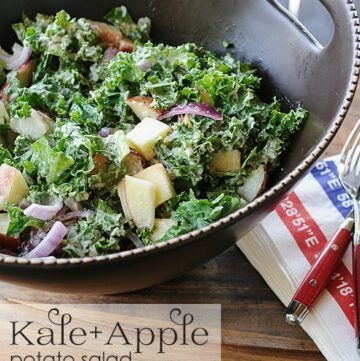 (If you have a double boiler use that). Place the bowl over a pan with boiling water and stir until the caramels melt. Add a bit (1 - 2 T) of sweetened condensed milk as the caramels melt. 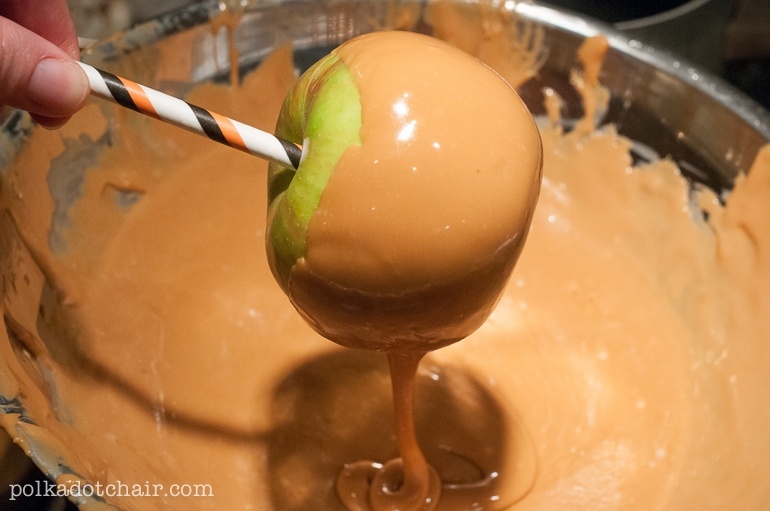 Remove from heat and dip apples before the caramel hardens up. 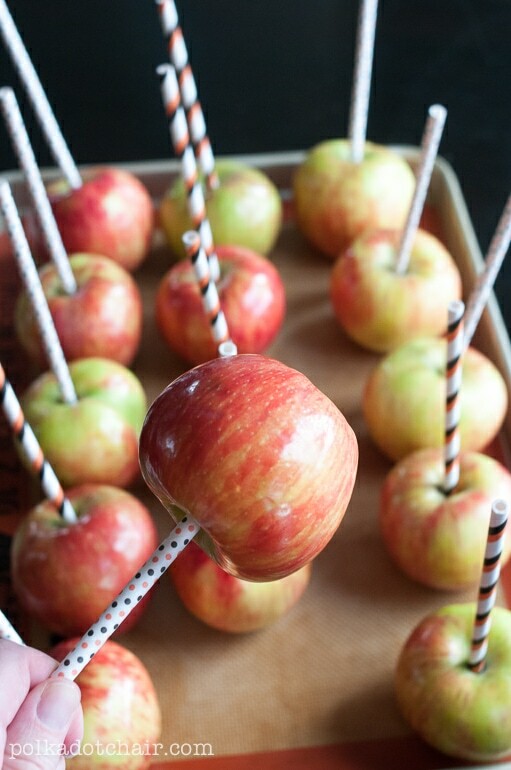 The first step is to insert the lollipop sticks into the apples. 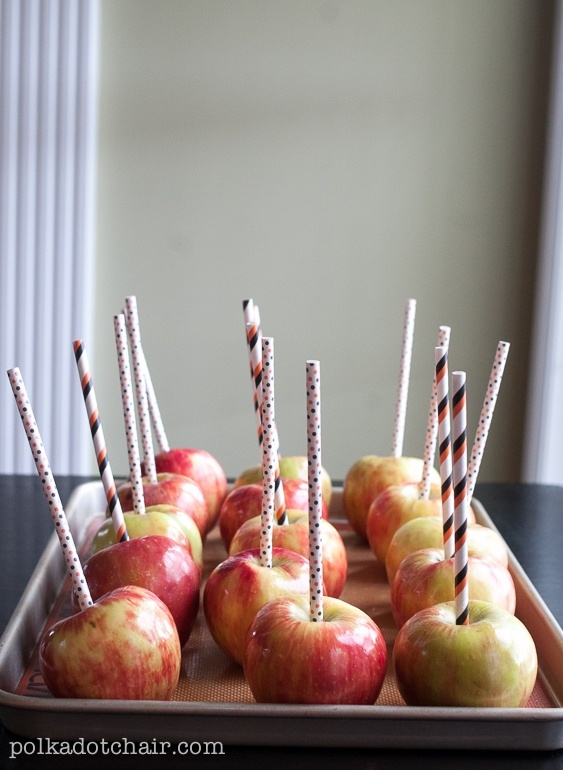 I used a small knife to poke a hole in the apple so that the sticks would slide in easily. 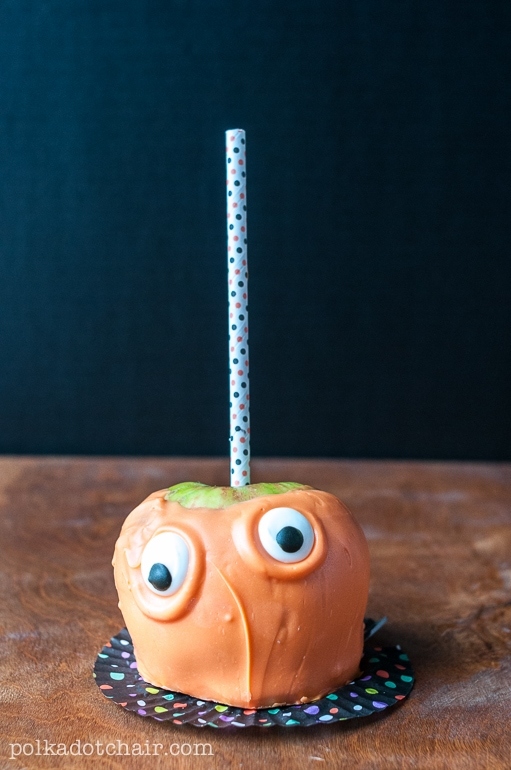 Here’s a tip- if the apples your working with are too heavy and don’t hold up to the sticks, insert a bamboo skewer into the lollipop stick to make it a bit more sturdy (you can just hide it inside). 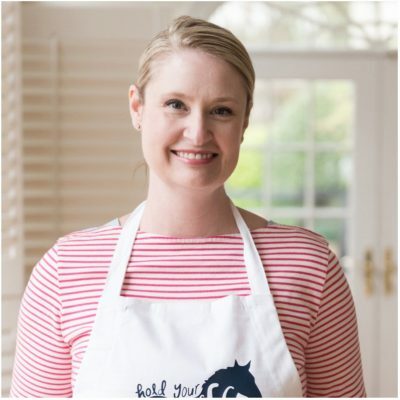 Next melt down your caramels in a double boiler. I don’t actually have a double boiler, I just use a metal mixing bowl and place it over a pot of boiling water. I added a bit of sweetened condensed milk to the caramels to get them the consistency I wanted for dipping. Let the apples cool completely, I put mine in the fridge for a bit. 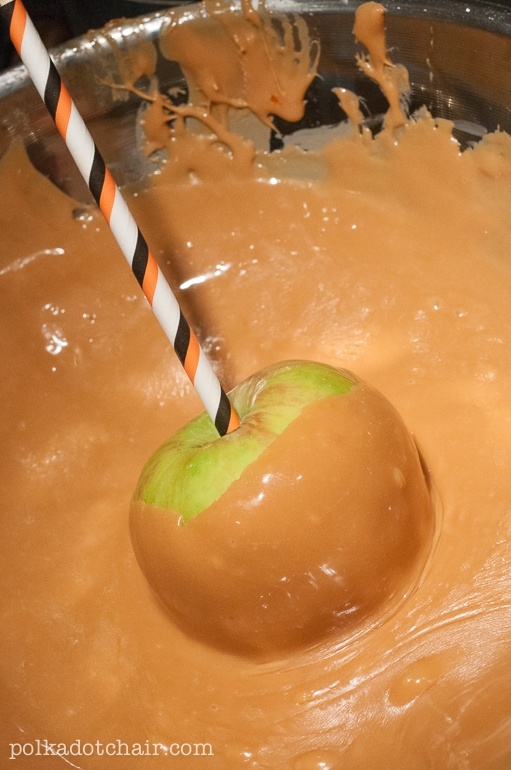 Then dip the caramel apples in the candy dips, let them harden up and decorate as you like. Here is my son working on his spider apple. He’s using licorice to make legs for the spider. 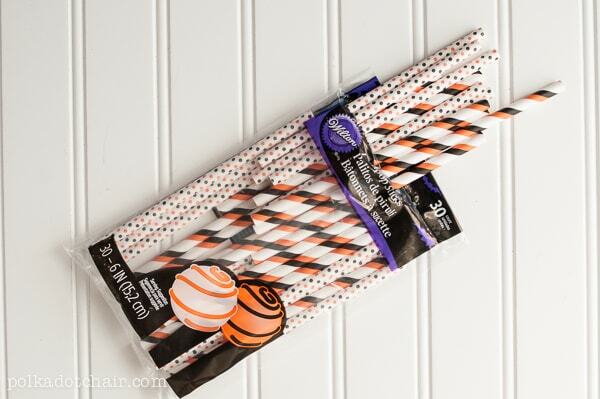 To make the bat, dip 2 pretzels in black candy melts. 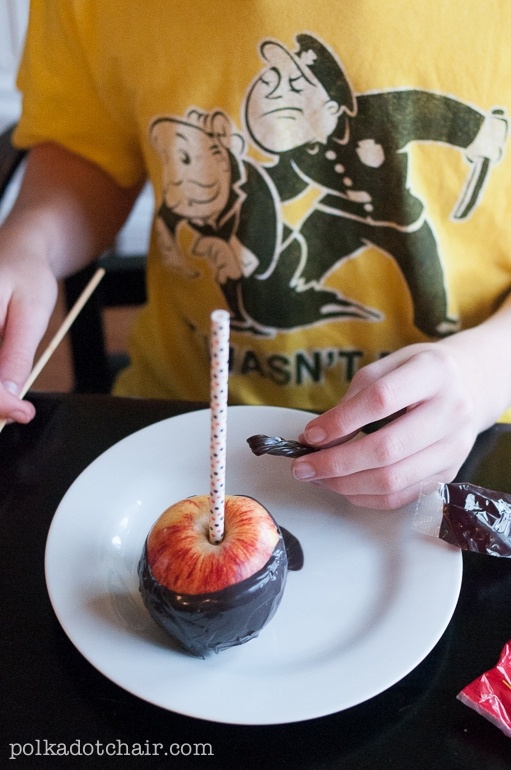 Then dip the apple in the black candy melts. 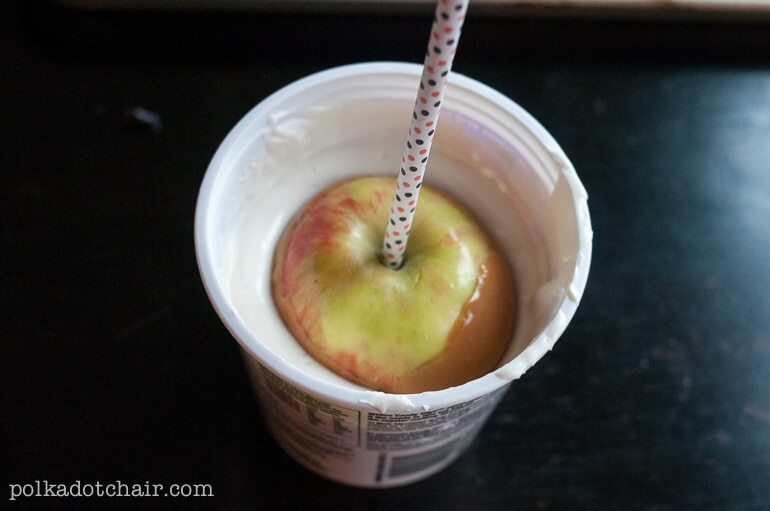 Cut a small slit in the side of the apple and insert the covered pretzels. 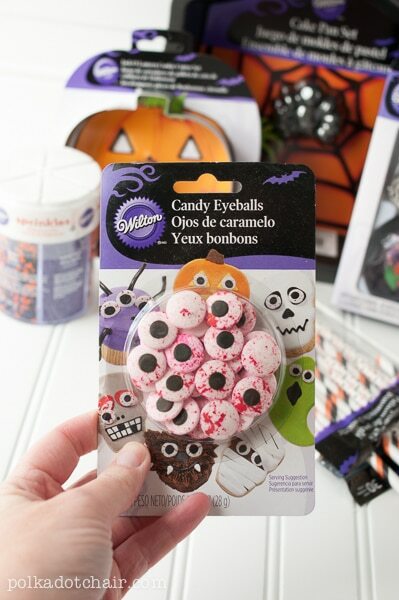 Use a bit more of the candy melts to seal the hole and attach the eyes. 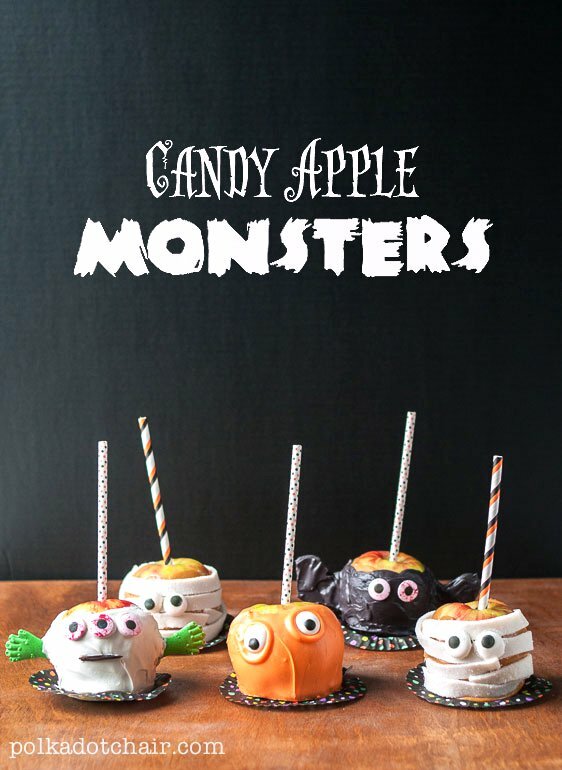 The monster is made by dipping the caramel apple in white candy melts and attaching the eyes and monster hands. 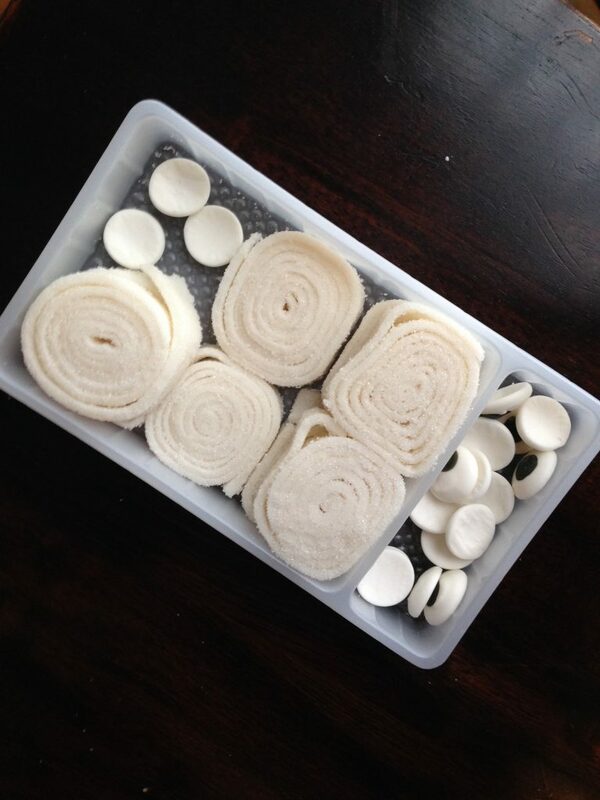 The Mummy might be my favorite, to make him just use the Wilton mummy kit. 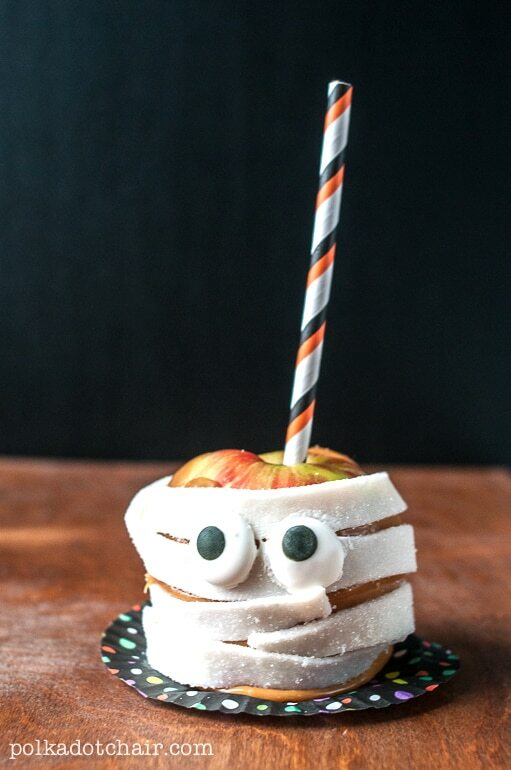 Wrap the candy around the apple (it will stick great) and attach the eyes with white candy melts. 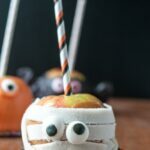 The “blob” was a happy accident made by dipping the apple in orange candy melts then attaching the eyes before the melts were hardened all the way. The eye slipped down a bit giving this guy a fun expression. 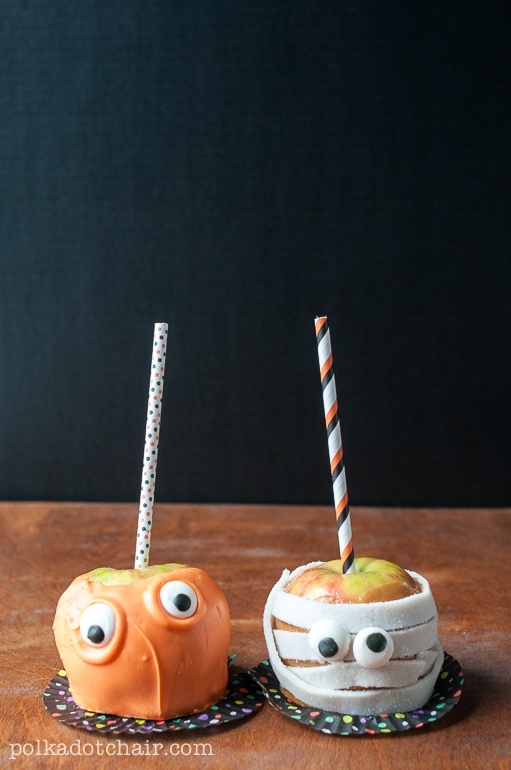 After we made them we thought of a bunch of other fun ideas to decorate the apples as well! 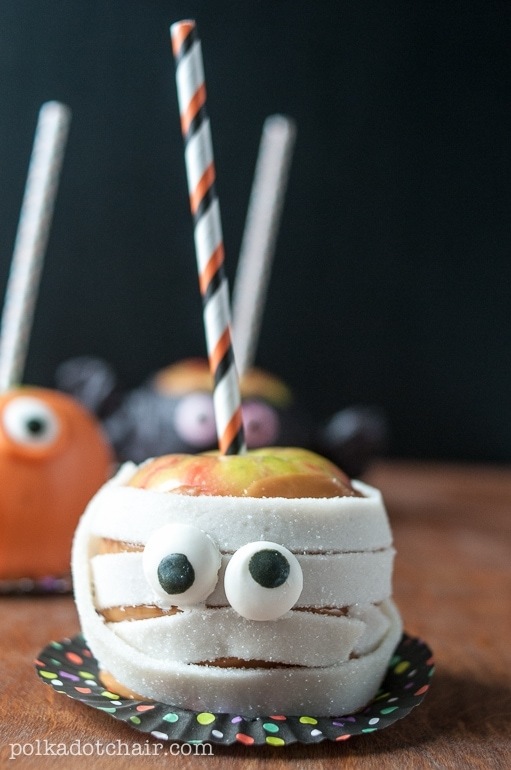 Wouldn’t a ghost or vampire apple be adorable? 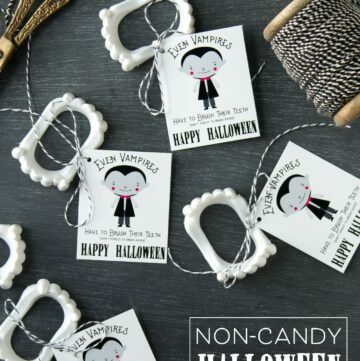 These are way super cute. 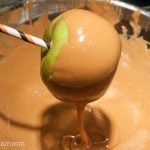 I just love the twist on caramel apples. Great project. We would be honored to have you share your ideas at our weekly Super Saturday link party. 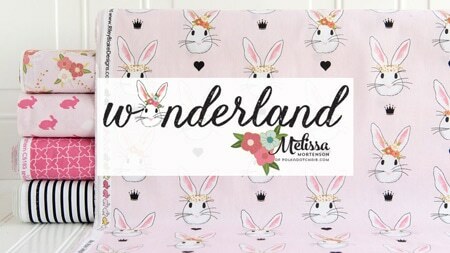 http://www.madefrompinterest.net/2013/10/super-saturday-link-party-14/ We go live Fridays at 8pm. 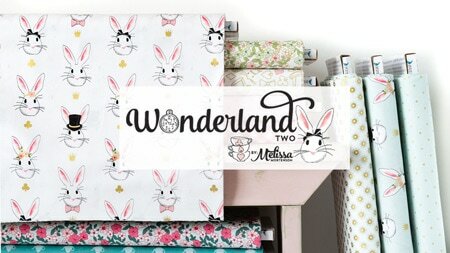 These are seriously some of the cutest things I have ever seen!! They are also incredibly well photographed! 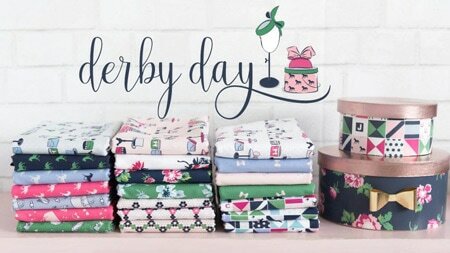 They jumped out on me on Pinterest, and then I spotted them being featured on TT&J! Way to go!! Love it! I love this! What a great twist on regular caramel apples. 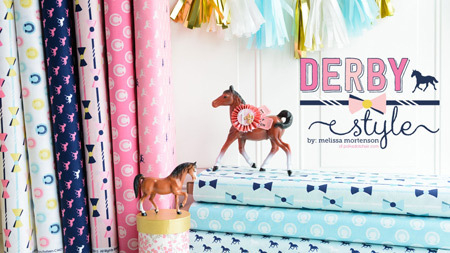 They are cute and creative! !